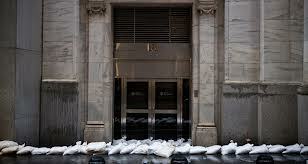 Yesterday’s images of the NY Stock Exchange with sandbags at the front doors, or cars floating by on Wall Street, were not taken from the latest science fiction disaster movie, not this time. This time they were real. And next time the storm could be worse. But despite all the dramatic headlines declaring Hurricane Sandy the worst storm to hit the East Coast in human memory, there has been barely a whisper of climate change in any of the top weather-related news stories. I was hoping that Sandy would prove to be a big wake-up call for the privileged denizens of the East Coast, many of whom hold influential positions in business, finance and government. But instead of people acknowledging the climate elephant in the room and starting to talk about proactive steps we can take to avoid such scenarios in the future, they are just following the usual reactionary script: marshalling disaster relief, urging the citizenry to donate to the American Red Cross, assessing the cost of the clean-up and how long it will take to put Humpty back together again. A storm like Sandy—or Irene, or Katrina—should prompt reflections on the awesome power of natural forces, and the puniness of human structures. Take our power away and we are suddenly rocketed back into the early 19th century. Take our food supplies away, and we become an angry mob in no time. Do it on a scale that impacts millions of people all living crowded together, and you have a recipe for unprecedented horror. This is not a pitch for the next action thriller film, and it’s not idle chatter. These are the kinds of scenarios our governors and national leaders were worrying about yesterday when they authorized the shutting down of mass transit, schools and businesses. We were lucky this time. Sandy weakened as she came ashore and the damage, while serious, is manageable. What we know is that with each passing month and year of inaction on global heating, the storms will become more frequent and more intense. In the years to come, we will look back on Sandy as child’s play, just a warning of what is yet to come. What should we be doing now, as individuals, as a nation, and as a global human community? We should be starting a massive shift to renewable, clean energy sources. And I’m not talking about “clean coal.” Wind, solar, geothermal, tidal—these are the sources that can safely feed our energy addiction, without driving our climate into ruin. We should be shifting away from cars and highways to trains and mass transit. Bicycles, too. And we should embrace the shift to online commerce and education, to avoid the need for a great portion of the horrendous morning commute. We should start a concerted effort, especially in densely populated areas like the northeast corridor, to bury the power lines. Tangled mats of downed overhead wires should become a thing of the past, and quickly. We need to become much more resilient at surviving big storms, and our electric grid is a 19th century anachronism in need of immediate upgrade to the 21st century. We need to start a serious citizens’ movement to resist the tripartite junta of the fossil fuel industry, Big Agriculture and Big Chemical. These three industries must be held accountable for the tremendous destruction they are wreaking on our environment, and on us as individuals. I’d like to see Big Insurance take our side in this battle; I am sure they’re getting tired of always being stuck holding the bill when the next disaster strikes…. These storms are not random events. They are getting bigger and closer together and less predictable. The hotter the climate, the more the ice melts at the poles, the more freakish our weather will become—except that freakish is going to be our new normal. It’s time to stop the denial, stop allowing ourselves to be distracted from the very serious questions that face us now. 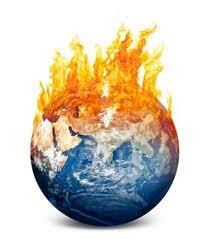 It boils down to this: are we going to leave a livable Earth to our children and grandchildren? Or are we going to go down in history (if there are any left to carry history forward) as the most criminal generation of all time? Finally, a mainstream media reporter has the courage to bring up the elephant in the newsroom: CLIMATE CHANGE!!! In a blog post—not a front page or prime time news story, alas–ABC News reporter Bill Blakemore writes candidly of the fear that a realistic assessment of the threat of climate change must raise in anyone who cares about the future of human civilization on this planet. “Established scientists, community and government leaders and journalists, as they describe the disruptions, suffering and destruction that manmade global warming is already producing, with far worse in the offing if humanity doesn’t somehow control it, are starting to allow themselves publicly to use terms like “calamity,” “catastrophe”, and “risk to the collective civilization,” Blakemore writes. Blakemore advises us to take a page out of the U.S. Air Force playbook and learn to “hug the monster” of climate change, rather than recoiling into fearful paralysis. “If you freeze or panic — if you go into merely reactive “brainlock” — you’re lost,” he says. It is absolutely clear that we stand on the edge of the greatest crisis ever to confront human civilization. It is also quite clear that almost NO ONE WANTS TO TALK ABOUT IT. Sometimes when I bring up the reality of impending climate change I really feel like the drip, the drone, the total wet blanket in the room. People actually give me dirty looks and do their best to change the topic ASAP. Okay, people. You go your way and I’ll go mine. I don’t know whether it’s possible for humanity to survive the coming catastrophe of global heating. If we survive, it will only be through a drastic change in our ethos and way of life. We cannot continue to treat the planet as our private killing field, burning and hacking at all other life forms as if they did not matter a damn. We in the Western world cannot continue to pretend that our wasteful, profligate lifestyles are a given that cannot be questioned, touched or changed. To me the monster in the room is not so much global heating itself, as the destructive, predatory mindset that has brought it about. If we are going to embrace the monster, as the Air Force suggests, and even employ anger as a tool of resistance, than we need to start getting angry at ourselves. We Americans and Europeans have brought the planet to the brink of the next “global extinction event”—aka, the brink of total annihilation for the majority of current life forms on Earth. Where is the anger? Where is the outrage? Where is the will to change? First step: acknowledge that the problem exists. Thanks, Bill Blakemore, for getting us just a little bit closer to taking that first baby step.